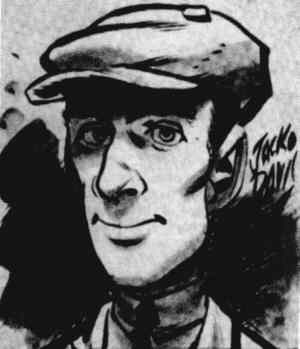 Jack Davis is one of America's most successful commercial artists. But he'll never shake his humble origin in comics — nor, from all indications, does he want to. born in Atlanta, GA, on December 2, 1924. His first comic book work appeared in the ninth issue of Tip Top Comics (December, 1936), which, in-between reprints of Nancy, The Captain & the Kids and other United Feature newspaper strips, set aside an occasional page for drawings sent in by readers. He also contributed cartoons to school papers in both high school and college, and while at the latter, co-founded an off-campus magazine of risqué humor called Bullsheet. After graduating, he took a few odd cartooning jobs, such as assisting Ed Dodd on Mark Trail and interning as a cartoonist at The Atlanta Journal. A training manual he illustrated in 1949 for the Atlanta-based Coca-Cola company earned him enough money to buy a car and take off for New York, where most of the good cartooning jobs were to be found. Within a few months he'd been fleeced of his remaining money by a con artist, and his car was stolen. But he stuck it out, and eventually found work at EC Comics, where editors Al Feldstein (The Yellow Claw) and Harvey Kurtzman (Goodman Beaver) found his unusual style ideal for such titles as The Vault of Horror and Two-Fisted Tales. It was at EC that he achieved the highest accolade that can ever be bestowed on an illustrator of horror comics — two of his panels were reprinted on the opening page of the art section of anti-comics crusader Fredric Wertham's 1954 book, Seduction of the Innocent, as shocking examples of the sort of comic books that were corrupting America's youth. EC folded its line of traditionally-formatted comic books in 1955, but Davis continued to work for Mad magazine, the company's one remaining title. He also worked for Atlas Comics, the 1950s forerunner of Marvel, and for a few smaller companies. By the1960s, he'd branched out into bubble gum cards, movie posters and display advertising, but still found time for comics — for example, Little Annie Fanny and Yak Yak, Dell Comics' now-obscure 1961-62 attempt at hip humor. Among his last jobs in traditional comic books was The Rawhide Kid, where he illustrated three 1963 issues. Before long, kids who'd enjoyed his EC work grew up and, like those of most other generations, became doctors, lawyers and art directors. The latter proved how badly Davis's work had corrupted their youth by offering him more and more lucrative, more and more prestigious jobs. Davis has now done dozens of album covers, in all different genres of music, as well as dozens of covers for such high-profile magazines as Time and TV Guide. And let's not forget his critical acclaim. Among the many honors that have been heaped on Davis is the Reuben Award, by which The National Cartoonists' Society named him Cartoonist of the Year for 2000. Through all these years, and in all these venues, one thing has remained — his unique style, which he never compromised for commercial or any other reasons. It shines out like a beacon, instantly recognizable on all those covers, posters, gum cards, and wherever else it might appear. Text ©2001-10 Donald D. Markstein. Art © Jack Davis.